A selection of pictures mostly from the Dutch province of Limburg in the south of the country. Railion Nederland 1616 with the DGS 49665 (empty limestone Beverwijk - Hermalle/B) enters the yard in Sittard. The trains change power here to diesel for the run into Belgium as the electrics can only operate under the Dutch 1500V DC catenary. 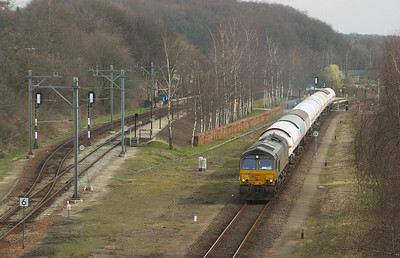 6518 + 6510 lead the empty limestone train 49665 (Beverwijk - Hermalle/B) through Argenteau in the Meuse valley. 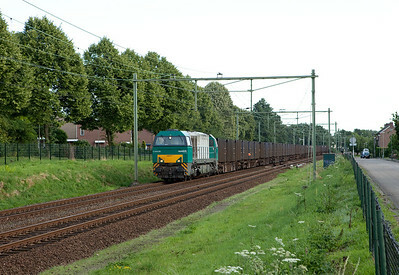 This is the same train as in the previous picture, now with Railion NL 6400s as power. This location is actually in Belgium. Maastricht-bound Veolia GTW 2/8 departs Valkenburg. 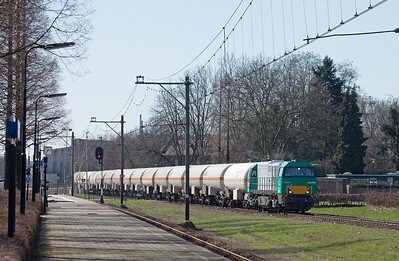 R4C PB05 brings a train of compressed gas tank cars for the DSM chemical complex in Lutterade through Landgraaf. 6503 powers the local train 55802 (Born - DSM Lutterade) into the yard at Sittard, returning from the port of Born. 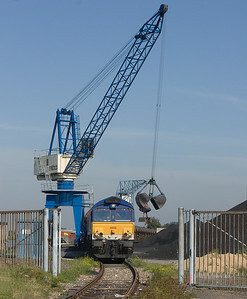 In 2008 ERS returned a number of class 66s to the lessor, the first of which was 6602. The unit was picked up by SNCF Fret Benelux and is seen here inside the Enerco coal terminal at Born/NL with the DGS 48647 (Born - Anglefort/F) which it will lead south through Belgium into France as soon as loading has completed. In late summer 2008 a number of Plan V assignments around Sittard were still running. Veolia replaced their leased units with GTW 2/6s and 2/8s later in the year, only NSR stills runs the old EMUs in the area. Here one of them leaves Sittard station bound for Heerlen and Kerkrade. There is a lot of chemical traffic in the Sittard area due to DSM's large chemical complex in nearby Lutterade. Here R4C PB02 and a G2000 enjoy the autumn evening sun in Sittard. 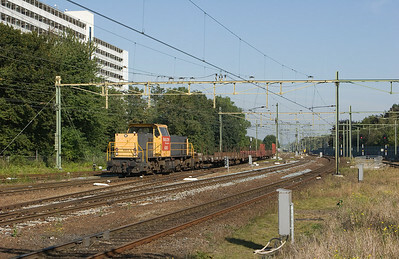 A six-car IRM leaves Sittard southbound for Maastricht. 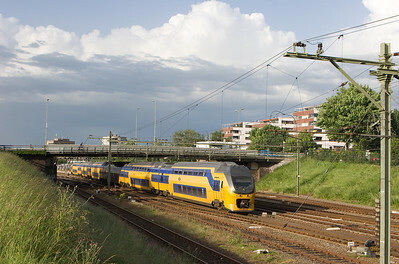 These EMUs have provisions for multiple power systems but currently only run within the Netherlands. International traffic is the norm in the tricountry area. 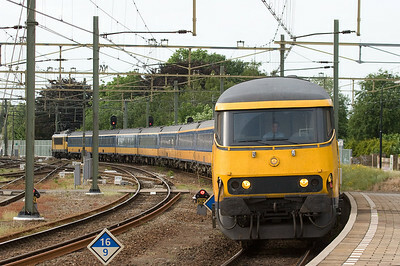 A set of Dutch IRM EMUs is stopped at the platform as a limestone train powered by two Belgian class 77s gets under way. 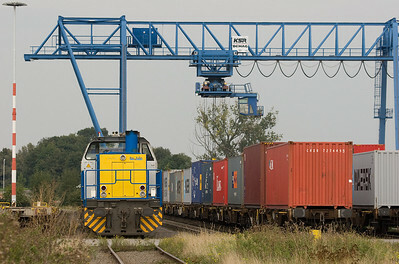 A Rail4Chem G2000 unit lays over between trains. The unit at far right is a class 6400 owned by Railpro, the Dutch rail infrastructure company. 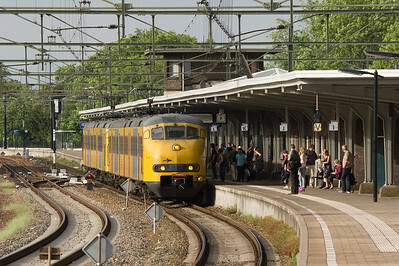 These two vintage Plan Vs run as a Stoptrein (all stops train) to Heerlen. There is a good crowd in attendance on the platform at Sittard. Notwithstanding all the EMUs in the area, some ICs are still formed of conventional equipment. 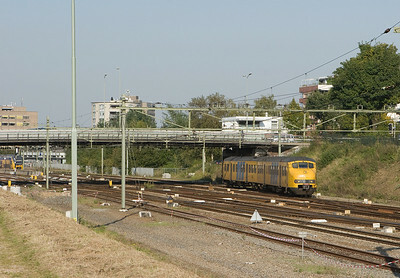 This quite sizable train is bound for Maastricht and is seen here entering Sittard station. 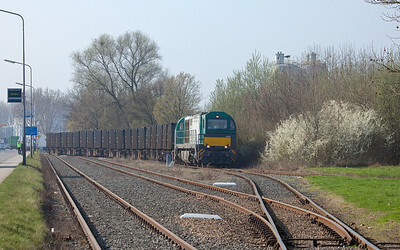 Coal train DGS 48647 (Born/NL-Anglefort/F) powered by one of SNCF Fret's Vossloh G2000s passes through Sittard. 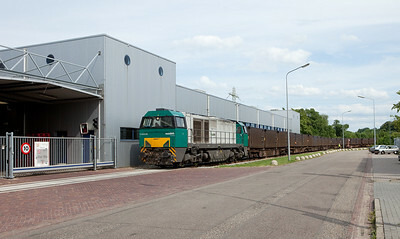 Rurtalbahn locomotive V153 inside the Born container terminal. 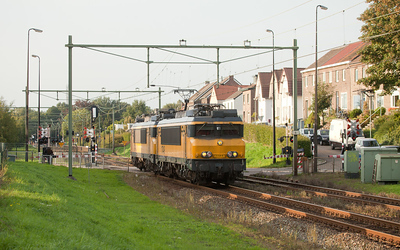 NSR 1740 + 1749 run light engine to Maastricht through Bunde. 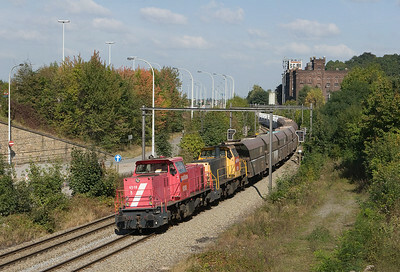 63084 is always an exceedingly colorful train, courtesy of the UBC and IFF bulktainers it carries to the port of Stein next to the giant DSM chemical complex in Geleen-Lutterade. 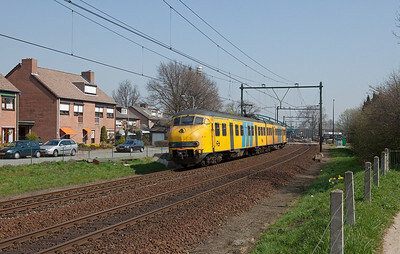 It has almost reached its destination in this view, showing 6517 powering it southbound out of the Sittard station. 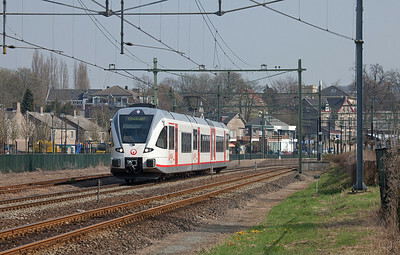 Plan V southbound to Maastricht departs from the station stop at Beek-Elsloo. 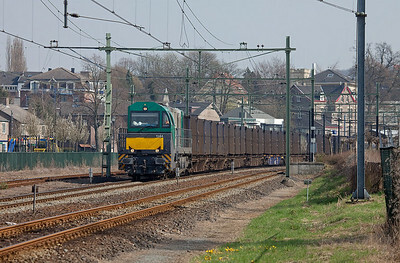 Vossloh 1384 with the ACTS-operated trash train 50094 (Haanrade - Maastricht - Wijster) passing through Valkenburg. ACTS serves a number of trash transloads in Limburg, including one in the Beatrixhaven industrial estate north of Maastricht. 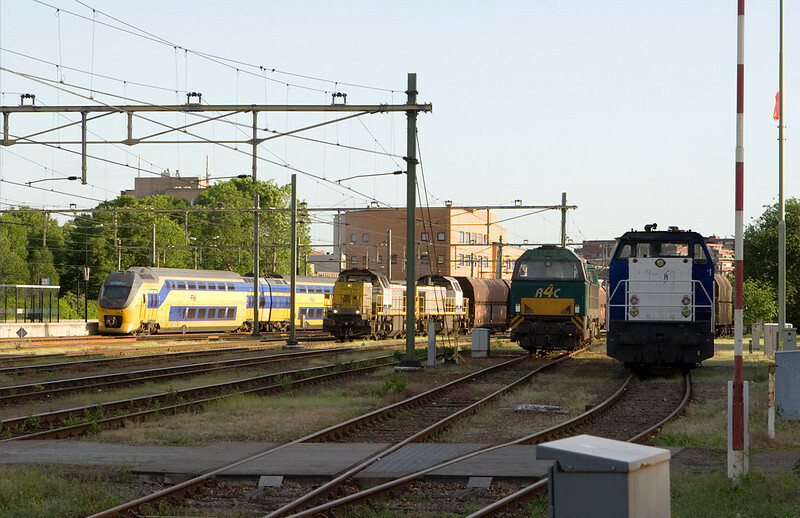 Here we see rented Vossloh G2000 1384 (with the odd asymmetrical cab) with train 50101 (Beatrixhaven - Maastricht) after having pulled the Essent facility and backed the train down to the little yard. As soon as the brakeman has walked back to the engine they will pull out, run down the main south into Maastricht, pick up the other half of their train (from Haanrade) left there, and run north to Wijster. SNCF Fret Benelux G2000 1615 leads the CO2-train 48649 (Lutterade DSM - Lyon St. Priest/F) out of the giant DSM chemical complex at Geleen-Lutterade. 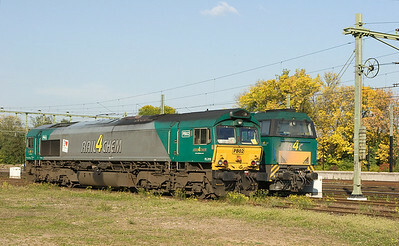 ACTS G2000 1001457 with the trash train 50094 in Bunde. 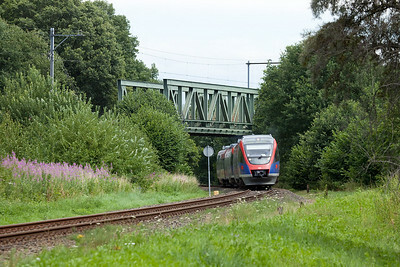 Euregiobahn Talent on line RB 20 nears Landgraaf. 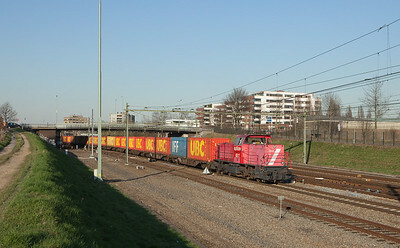 ACTS G2000 1001457 with the trash train 50101 (Mttrix - Mt) in Beatrixhaven. 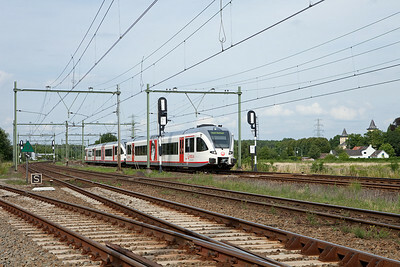 Veolia Stadler GTW 2/6 and GTW 2/8 at the Beatrixhaven industrial track junction.